Empty stomach growls? Burning sensation in the chest? Stomach pain? These are the signs that one must be suffering from acidity or GERD (GASTRO ESOPHAGAL REFLUX DISORDER). 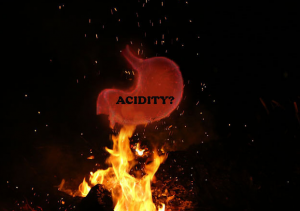 Acidity is a medical condition which is caused due excess production of acid. This acid is produced by the glands of the stomach. Acidity causes signs such as ulcers in the stomach, gastric inflammation, heartburn and dyspepsia. For maximum benefit – fatty, spicy, sour foods, alcoholic drinks and smoking to be avoided. Intake of cold milk and leafy vegetables is recommended.